"Remember, an ounce of loyalty is worth a pound of cleverness." 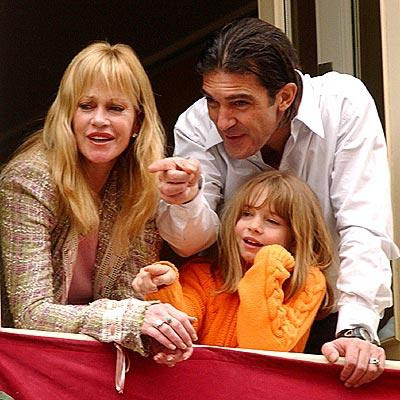 Antonio Banderas is allegedly desperate to keep his marriage with Melanie Griffith intact after reports of his infidelity took their toll. A number of recent reports have claimed that Banderas has been unfaithful to his wife of 15 years. Amongst other incidents, the actor was allegedly spotted kissing another woman while vacationing in Cancun. Melanie Griffith's initial response was "BoyfriEND, girlfriEND, friEND, everything has an end, except for family," the star posted online, according to Celeb Dirty Laundry. "Antonio has been desperately trying to win Melanie's trust back," a source reported to RadarOnline on Tuesday. "He has been doing everything in his power to revive the romance -- flowers, sweet-talking on the phone, and extravagant gifts -- because he realizes that she is close to her breaking point." Proof of her breaking point came last week when the star was photographed out and about in town without wearing her wedding ring. Men should behave and should be a one man-woman so their marriage would never be in danger. A descent woman should never enter into a relationship with a married man.